After his first World Cup success in Engelberg, Karl Geiger is THE German hope at the Four Hills Tournament. Right at the start he has to prove himself on his home hill. Karl Geiger knows every alley, every chapel and every bakery in Oberstdorf. "Here I was born, here I am at home", says the 25-year-old, who grew up in the shadow of the ski jump. This is exactly where, on the legendary Schattenberg, Geiger starts the 67th Four Hills Tournament this weekend as the number one German hopeful. Geiger "a man for the podium"
For Geiger, the most important thing is to clear his head. "Karl's mind cinema will also have started over Christmas. He will have started to dream," says Sven Hannawald, who was the last German to win the tour in 2001/02. If Geiger should survive the Oberstdorf hype unscathed, according to Hannawald, much is possible: "He is definitely a man for the podium in the overall classification. 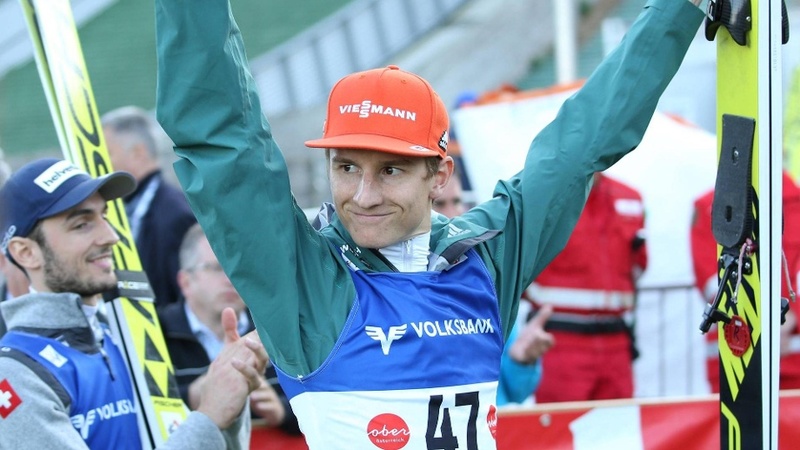 Until a few months ago, Geiger was in the second, if not third row of ski jumping. Step by step he worked his way forward, at the 2018 Olympics in Pyeongchang he belonged to the German silver team, in Engelberg two weeks ago he managed the big coup. "I hope it won't be the only victory. It will be a hard piece of work to make the second one," says national coach Werner Schuster. Maybe he will succeed in Oberstdorf already. So far, however, Geiger has never been able to exceed 17th place on his home hill, he experienced a bitter hour twice: In 2012 he missed the competition by 0.5 points in the qualification, a year later by 0.7. "This year I can approach Oberstdorf more relaxed. Nobody expects me to become a serial winner right away. I don't have to tear the world apart," says Geiger now. The expectations are still there, whether Geiger wants to or not. "Karl clicked. If anyone can beat the Japanese Ryoyu Kobayashi, it's Karl," said former tour winner Dieter Thoma in the SID interview. In any case, nobody should underestimate the quiet violinist who prefers to let his deeds speak for themselves. He has become a "dirtbag" in competitions, he says: "I hit it, I'm rigorous, hopp or topp. And perhaps, quite perhaps, even the big coup will succeed. Just like the Austrian Thomas Diethart, who travelled to the tour in 2013/2014 without winning the World Cup and sensationally triumphed there. "These very special stories are repeated again and again. Who would have thought then that Diethart was so stable? ", says national coach Schuster: "You wait for years for a tour victory, on Friday, at Wellinger, at Freund's - and maybe someone else will do it for you?